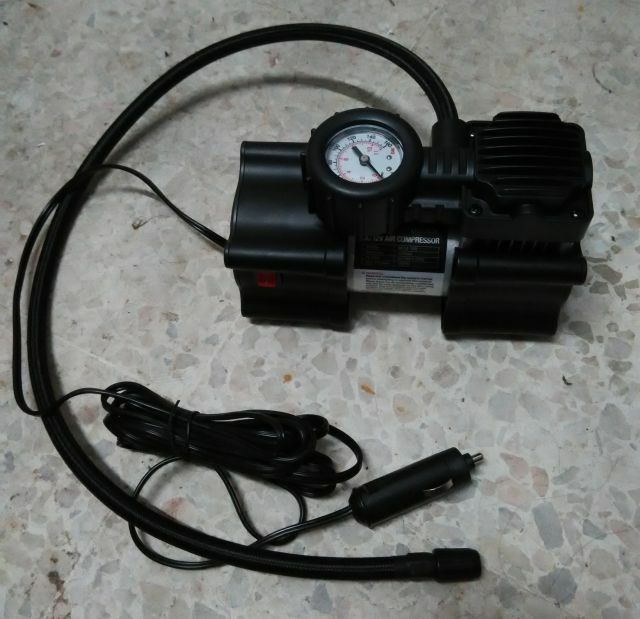 Portable air compressor bought from Mr. DIY. The car down in a parking lot at a hawker center in Cheras. What options did I have? The first problem is dead battery. Option 1. Ask the foreman come to do repairing, at least to pay them RM50 and above. Option 2. Do-It-Yourself. Coincidentally a foreman came to repair a lady driver’s car at the next parking lot for a battery dead problem too. Asked the foreman to jump start my battery, it worked. But my battery dead again when I switched off the engine after the foreman left. I supposed to pay him RM10, but no small note in my wallet, I apologetically paid the foreman RM5 for a minute work. Carried the battery to a motor workshop where I bought the battery for checking by uphill walking for about 100 meters. The 7-month old YUASA battery was confirmed in good condition. I realized the problem may be due to weak connection in the poles or faulty alternator. Since the workshop staff personnel are very busy, I then brought the battery and installed it back. The lady luck was back, the car engine was started successfully. I chose option 2 is to avoid buying a new battery. My past experience told me the foreman will bullshitting the battery is not good and cheated you to buy a new one. What else you can do under such circumstance? The second problem is how to solve tyre deflated problem caused by a screw. Option 1: Ask the foreman come to change the tyre. The site service charge may cost RM50 to 100. Option 2: Drive the car with a deflated tyre to a nearby workshop which is 200 meters away. The deflated tyre will be scrapped and buy a new tyre will cost me RM150 or more. Option 3: Change the spare tyre myself. It would take me, an unskilled repairman one to two hours. After that, have to go to workshop to patch the puncture and put back the wheel. Cost about RM10-20 to repair the punctured tyre and put back the wheel by foreman. Option 4: Buy a portable air compressor from Mr. DIY hardware shop nearby for RM95. Inflated the tyre to 2 bars and quickly drove my car to a workshop in my housing estate for patching the puncture. The cost is RM95+7 or RM102. I chose option 4 is to have a portable air compressor for my car and bicycle in future, otherwise I would go for option 3. My options have avoided me for spending extra RM300 or more.